One of my favourite gifts to give friends, family and neighbours at Christmas time are edible gifts and our favourite to make is fudge. Now, the traditional fudge recipes that my grandmother cooked was confusing and difficult with very temperature sensitive cooking. I stayed well away from them until a friend showed me how to make fudge in the slow cooker and that was it Fudge Recipe testing began in the Rainy Day Mum house. 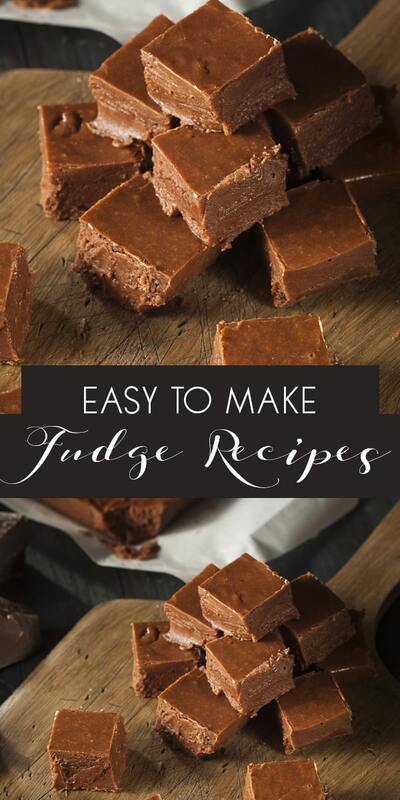 With these Easy Fudge Recipes that even kids can cook, you can make delicious gifts quickly and easily that everyone will enjoy. 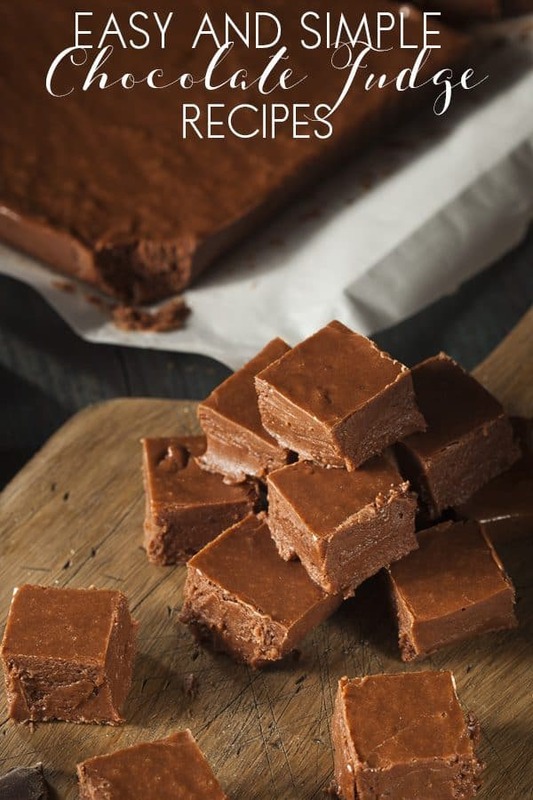 Scroll down for the collection of recipes for fudge and click the blue underlined links or the images to take you to these simple delicious recipes that you and the kids can make together. Using the slow cooker is my favourite way to make fudge. It’s a little more timely than when we use a double boiler or make it in the saucepan but it tastes just as nice and with the low heat in the crockpot, it’s perfect for cooking with kids. 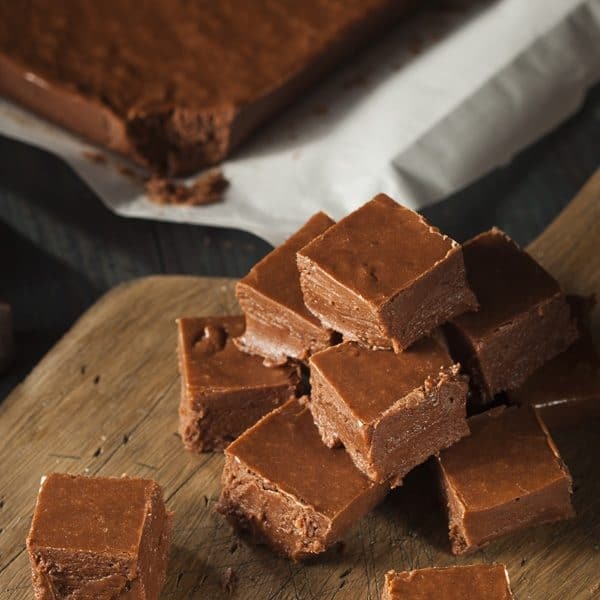 Our basic Slow Cooker Fudge Recipe is a chocolate and vanilla fudge it takes around an hour and a half to make on a low heat but when using the slow cooker to make recipes you have to remember to adapt it to your own crockpot. Some take longer others shorter depending on the temperature setting for the “low”, “medium” and “high” for the individual model. 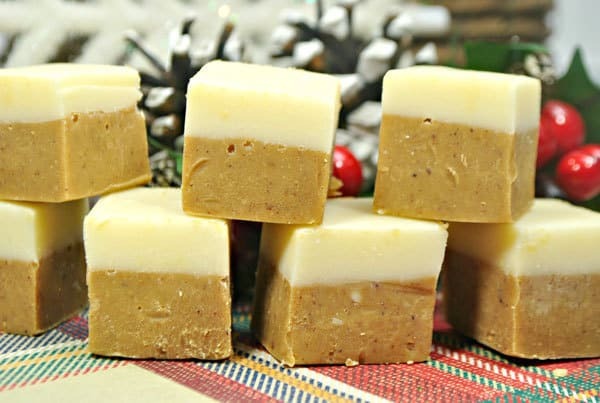 If you love Gingerbread and White Chocolate then our Layered Gingerbread and White Chocolate Fudge Recipe is for you. It tastes amazing and if you want to make it a little less strong then throw in an extra handful of White Chocolate Chips to the Gingerbread and it will be much more smooth. 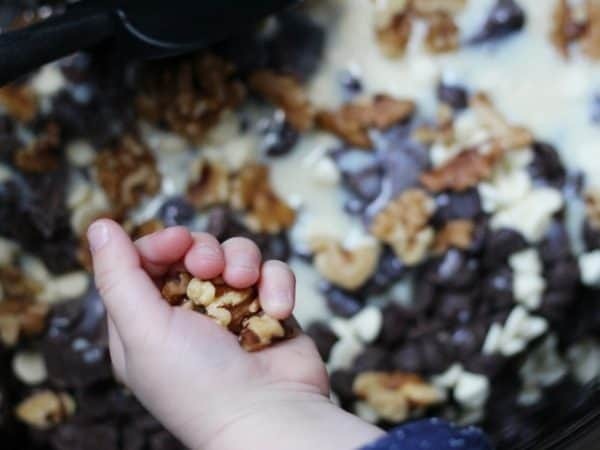 We used the same basic slow cooker fudge recipe and adapted it to create a delicious Christmas flavoured fudge with walnuts and cranberries which was also perfect for showing our kids how Metamorphic Rocks were formed!!! A bit of delicious edible science in the kitchen and a treat for the whole family in one go. 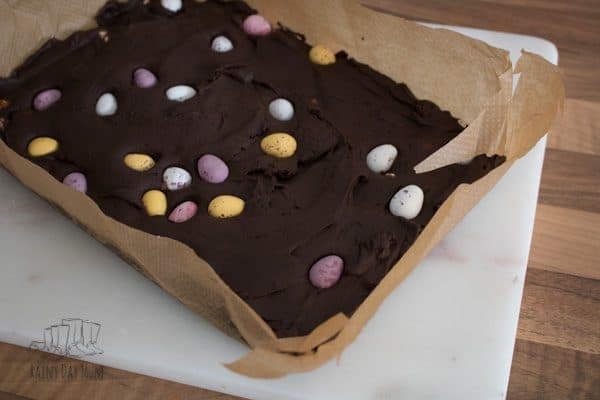 Although not necessarily for Christmas this Cadbury Mini Egg Slow Cooker Dark Chocolate Fudge is REALLY Indulgent. If you like dark chocolate then go ahead and make it as is. But if you want something a little less rich then switch out the dark chocolate chips in the recipe for milk chocolate as this won’t be so rich. Some of the recipes we have shared for fudge we have made on the hob. Using a double boiler or straight in the pan. All of these have instructions included to adapt for the slow cooker or to make as is. 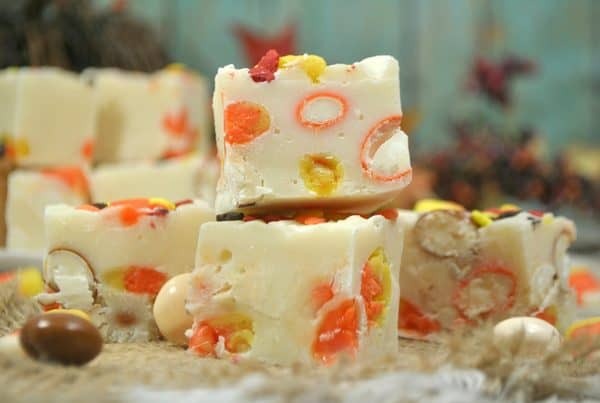 If you have any candy corn left over from Halloween then this delicious Candy Corn White Chocolate Fudge can be made and shared. We loved adding the pumpkin M&Ms but if you don’t have them then switch them for orange, yellow and brown normal M&Ms and they will be equally as delicious. 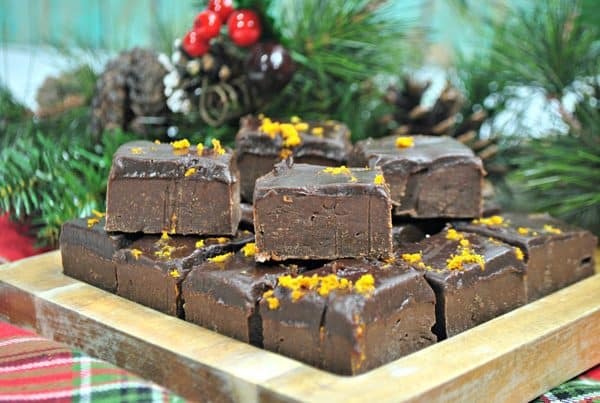 Chocolate and Orange are my favourite combination of Chocolate and our Chocolate Orange Fudge with REAL orange flavours is even better than my attempt with Terry’s Chocolate Orange. Sprinkled with Orange Zest it’s a real Christmas Party Favourite for the family and people have been asking me to make it again already! 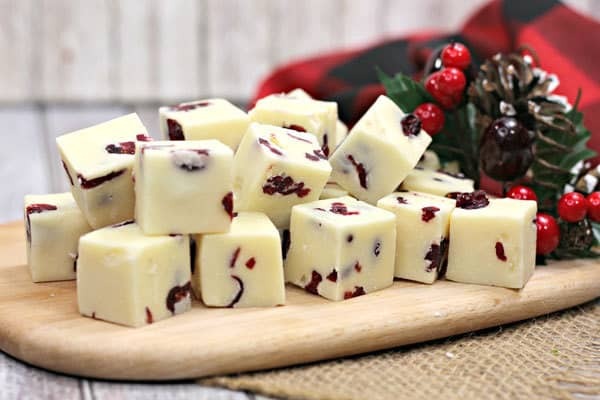 Another perfect Christmas Fudge is this White Chocolate and Cranberry Fudge Recipe. It’s extra sweet and the perfect choice for those friends and family that have a sweet tooth or just as a treat for you. By the way – this recipe! SO EASY THE KIDS CAN COOK IT TOO! 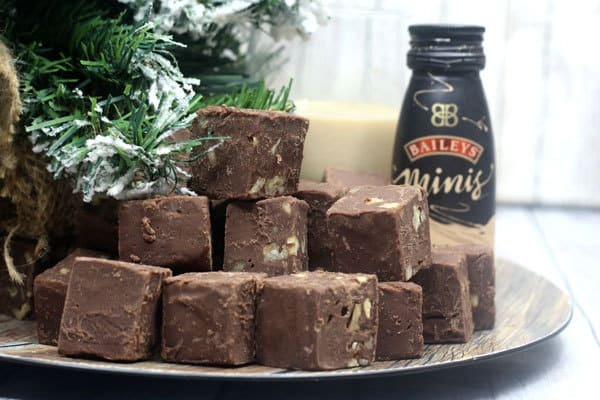 Another real treat of a fudge this Easy Baileys Fudge Recipe with chopped pecans is perfect for Christmas. Not one to share with the kids but makes a real treat for you and delicious gift for others. These ingredients are linked to Amazon if you buy via the links we may earn a small commission on the sale. The basis for most of our fudge is chocolate chips. Unlike cooking chocolate I find these are easier to melt and for kids to use. Depending on the taste we are after we sometimes use semi-sweet like the ones pictured and other milk chocolate and then for some white chocolate as well. I also have some in the store cupboard as we also use them for cookies and cakes as well. All of these are condensed milk fudge recipes so getting a few tins is essential. They are each made with a 397g or 14oz can of sweetened condensed milk and I like to have a few in the cupboard for when teachers gifts or neighbours housewarming gifts are needed quickly when I forget! Like the condensed milk all of these are vanilla fudge recipes as well and although this Madagascan Vanilla Extract is expensive it’s natural and has a much better than the cheaper synthetic vanilla essences that I have used in the past. The bottle is big so it does last a while as well and the smell is amazing. Want more Easy Simple and Delicious Recipes? Then sign up to our newsletter and get recipes straight to your inbox that the whole family will enjoy. We write a mix of family meal ideas, delicious desserts and ever so simple recipes that taste amazing that are perfect for kids in the kitchen to make too.